Diet and mental health are related. There is zero doubt about that. Nobody can deny that the state of your stomach, digestive system, and gut health will not have an effect on what is going on in your brain. I have written about gut health before and love that term ‘second brain’ for your digestive tract, which has 100 million neurons of its own. If your stomach is upset, your emotions will be wonky too. I am sure you have experienced moments yourself where you were feeling discomfort in your gut and it put you in a bad mood, led you to be short-fused and maybe even irritated. But it’s deeper than that! First things first: science! Let’s start with serotonin, which is commonly known as the happiness hormone. Serotonin is what influences our emotions–if we lack serotonin, we will feel a lack of energy, sadness, headaches and even migraines, sleep issues, anger, potential binge eating attacks as well as digestive disorders. The list is long and varies depending on the person but overall, lack of serotonin will probably affect you in many, unwanted ways. Now the fascinating fact, that a lot of people do not know, is that serotonin is mostly produced in the digestive track. 90% of serotonin is created in your gut, while 10% is produced in the brain. There is your connection! Back to science–in order for serotonin to be absorbed by the brain, you need the help of tryptophan, an amino acid, that helps to cross the blood barrier to the brain. When it comes to diet, the goal will be to both consume serotonin-rich foods and tryptophan-rich foods so you can make sure the serotonin actually gets to the brain. A fascinating fact is that most animal foods are not recommended when it comes to bio-available tryptophan. A study published in American Journal of Clinical Nutrition found that when tryptophan is consumed as part of a high-protein meal (like turkey, for example), brain serotonin levels actually decline. Once again, the plant kingdom is what will set you up for success. The key to improving your mood naturally is carbohydrates, which help with the serotonin synthesis. So stock up on sweet potatoes, corn, oatmeal, starchy veggies, fresh fruit and all these wonderful gifts of nature if you want to up your mood and fight depression. The benefit of going for these plant-based options instead of animals-based options, besides saving animals and the environment, is that they do not contain any saturated fat, abundant in dairy and meat. Another great option is to consume tryptophan-rich foods directly, such as seaweed, soy, cucumber, walnuts, mushroom and of course, leafy greens. 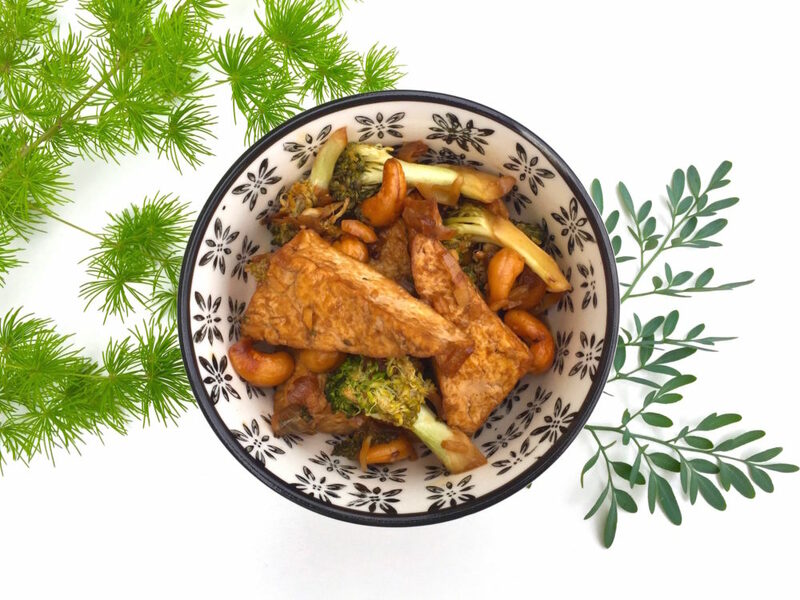 The best is to combine these foods with carbohydrates to maximize the effects–a miso soup with tofu and seaweed paired with brown rice, for example, or a mushroom stir-fry with leafy greens and a side of kabocha squash. Stay away from processed, refined sugar such as it can be found in candy and packaged foods as these sugars will lead to insulin spikes and mood swings. Keep in mind that the best way is always to get this from plants directly instead of playing around with supplements, which are often expensive, can come with side effects and are most likely not absorbed in the same way. What do you crave when you’re feeling moody? Great post! I’m someone who craves salty snacks when I’m sad, but I’ve found cashews and almonds are great alternatives for potato chips!